If you are a fan of CSI, you will be familiar with the excitement of collecting evidence in a crime scene so that the criminal does not get away. A pen which functions like a writing tool but doubles up as a self-defence weapon and CSI vial can be pretty handy. Looking ordinary much as any pen would, the UZI Tactical Pen has a sharp razor crown which can be used to strike an attacker when he least suspects it and at the same time collects his DNA sample. This would give the victim a chance to escape and subsequently deliver evidence to the police leading to the criminal’s successful arrest and conviction in court. 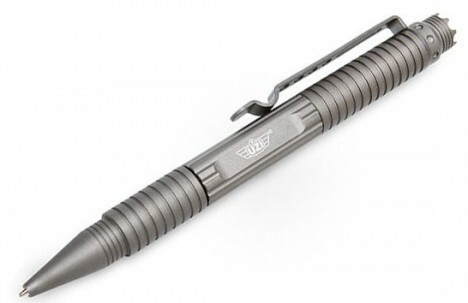 This military grade pen is made of high-grade aircraft aluminum and named after a submachine gun. It is water-resistant and can even write upside down. Measuring 6” x 55” (152 x 14mm), the UZI Tactical Pen can also be used in an emergency to break open a vehicle window to help trapped victims to escape. Pepper spray and taser may be less tactical or effective in fending off a would-be attacker than the nondescript but powerful pen.